TB-15 / TB-30 Torch Boosters elevate gas pressure to 25 psi at a flow rate of 15 scfh (TB-15) or 30 scfh (TB-30). TB-15 is suitable for a single small brazing torch while TB-30 will fuel a single cutting torch for material up to 3” thick. Get more information about TB-15 and TB-30 Torch Boosters. TB-60 / TB-125 Torch Boosters elevate gas pressure to 25 psi at a flow rate of 60 scfh (TB-60) or 125 scfh (TB-125). TB-60 is suitable for up to 2 cutting or brazing torches while TB-125 is suitable for up to 4 brazing or cutting torches. Torch capacity varies by type of torch being used - please contact G-TEC at 1-800-451-8294 to discuss your equipment. When using Messer ALFA torches TB-60 capacity is 1 torch and TB-125 capacity is 2 torches. Get more information about TB-60 and TB-125 Torch Boosters. TB-250 / TB-500 Torch Boosters elevate gas pressure up to 45 psi at a flow rate of 250 scfh (TB-250) or 500 scfh (TB-500). TB-250 is suitable for up to 6 cutting or brazing torches while TB-500 is suitable for up to 12 brazing or cutting torches. 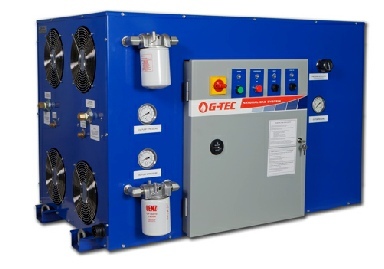 Torch capacity varies by type of torch being used - please contact G-TEC at 1-800 to discuss your equipment. When using Messer ALFA torches TB-250 capacity is 4 torches and TB-500 capacity is 8-10 torches. Get more information about TB-250 and TB-500 Torch Boosters. Standard Duty Torch Boosters are designed to run up to 12 hours per day in environments where ambient temperature is between 40F to 90F, maximum working pressure is 45 psi and where occasional downtime, such as after an electrical interruption, is acceptable. Heavy Duty Torch Boosters are designed for 24 hour operation, environments where ambient temperature exceeds 90F, working pressure is higher than 60 psi or where downtime cannot be tolerated. Heavy Duty Torch Boosters have an adjunct cooling module that extends system lifespan by removing excess heat and eliminating the normal 3 hour cool-down cycle of the Standard Duty model when it is turned off. TB-125C Torch Boosters boost gas pressure as high as 60 psi with a flow rate of up to 125 scfh and are used when the daily operation is 2 or more shifts, up to 24 hours, when ambient temperature is regularly greater that 90F or when downtime is very expensive. Get more information about TB-125C Torch Boosters. 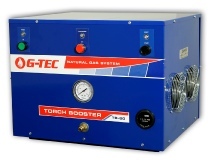 DM-60 Torch Booster/Refueler is two pressure boosters in one cabinet. As a Torch Booster it boosts gas pressure to 25 psi with a flow rate of 60 scfh and is suitable for up to 2 brazing or cutting torches. As a Refueler it fills G-TEC Adsorbed Natural gas Cylinders at 60 scfh. 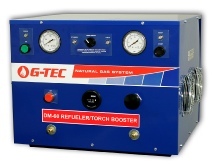 Get more information about DM-60 Torch Booster/Refueler. TB-500C Torch Boosters boost gas pressure as high as 60 psi with flow rates of 500 scfh and are used when daily operation is 2 or more shifts up to 24 hours, when ambient temperature regularly is greater than 90F or when downtime is very expensive. Get more information about TB-500 C Torch Boosters. TB-250C and TB-250H Torch Boosters boost gas pressure as high as 60 psi (TB-250C) and 150 psi (TB-250H) with a flow rate of 250 scfh and are used when daily operation is 2 or more shifts up to 24 hours, when ambient temperature regularly is greater than 90F or when downtime is very expensive. Get more information about TB-250 C and H Torch Boosters. Whether you have one torch or a dozen we have the right Torch Booster for you! TB-HVOF Torch Boosters are designed for High Velocity Oxy-Fuel thermal spray applications using high pressure natural gas at pressure up to 150 psi with flow rates of 500 scfh. 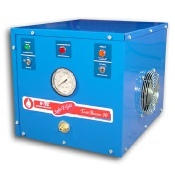 TB-HVOF integrates the Booster and Cooler operations in a single cabinet with an adjustable pressure control from 1 -150 psi.